PHOTO: Airberlin charter plane in flight. We have our roots in tourism, which we will continue to strengthen with new routes and increased frequencies,” said airberlin’s CEO Wolfgang Prock-Schauer, speaking at last year’s ITB. From its very beginnings, airberlin has been connecting German travelers to sunny places. Carrying Berliners on charters to Mallorca, Spain, was how it all began in 1979 for a carrier that, today, has ascended to the upper ranks of international aviation. Water cannons showered the airberlin jet when it landed at Southwest Florida International and marked the 20th anniversary this past spring of the connection between Düsseldorf and Fort Myers, Fla., that airberlin took over from the German leisure carrier LTU in 2007. Today, as the carrier launches what Prock-Schauer has called a “comfort offensive” with its new business-class service, it may be time to look back to airberlin’s beginnings to see just how quickly it has risen. In the 1970s as it struggled with the oil crisis, Pan Am laid off one of its pilots, Kim Lundgren, who went on to set up a charter company. The first flight departed from Berlin-Tegel for Palma de Mallorca in 1979. In 1991 Joachim Hunold purchased an 82.5 percent share in the company and thereby founded Air Berlin GmbH & Co. Flying two aircraft, airberlin began serving German tour operators with routes to sunny destinations on the Mediterranean. By 1998 airberlin was launching the Mallorca Shuttle, the company’s first scheduled passenger service. In 2002, it introduced the City Shuttle to fly between Europe’s major cities. When airberlin acquired the airline dba in 2004 it gained slots at Berlin, Düsseldorf, Munich and Frankfurt. Another giant step came with the purchase of LTU in 2007 and with the beginning of intercontinental flights by airberlin. Today, as Germany’s second-largest carrier after Lufthansa, it operates more than 800 flights per day. It connects Chicago, Fort Meyers, Miami, New York (JFK) and Los Angeles (seasonal) to Europe via its Düsseldorf hub. For Düsseldorf (www.visitduesseldorf.de), the partnership with airberlin has been a revelation. Nearly 4.25 million hotel nights were booked in 2013 in Düsseldorf, breaking last year’s record of 4 million. 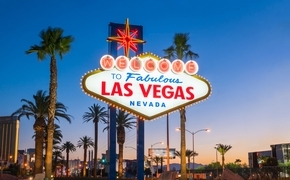 The U.S. tops the list of countries with the highest increase in visitor numbers and hotel nights at 126,266 hotel nights. This summer, airberlin offers nonstop service to Düsseldorf from Fort Myers three times per week on Tuesday, Thursday and Saturday. Next May, airberlin will increase flights from New York to its hub in Berlin from daily service to 10 flights weekly, and 10 to Düsseldorf as the Chicago to Berlin service increases from five flights per week to daily service. The new 19-seat business class is featured on the carrier’s long-haul jets. The new business-class seats can be fully reclined into flat beds. Entertainment onboard is provided via individual 15-inch monitors at each seat with a choice of more than 200 hours of movies, television shows, music and games, as well as a USB port. The new economy-class cabin also features on-demand entertainment systems, complimentary beverage service throughout the entire flight and improved culinary selections. 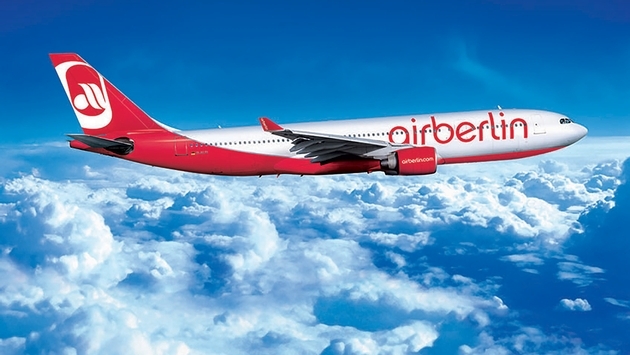 airberlin will equip its first aircraft with onboard Wi-Fi access in 2014, a service that will be rolled out gradually over almost the whole airberlin fleet. Airberlin turned a corner in 2011 when Etihad bought approximately 29 percent of the carrier, giving them both an extended network and the financial stability to keep growing the airline. As a oneworld carrier, airberlin is also linked to the American Airline network of 59 cities throughout North America. Airberlin’s frequent-flyer program, topbonus, has more than 3.4 million members and more than 120 partners worldwide. Topbonus members have the opportunity to enjoy a wide range of benefits and topbonus can be combined with business points, the airline’s corporate program. Before take-off, airberlin offers its status customers the opportunity to use partner lounges as well as airberlin’s Exclusive Waiting Areas. The first Exclusive Waiting Area outside Germany opened recently in Vienna. The airline offers other Exclusive Waiting Areas in Berlin, Düsseldorf, Hamburg, Cologne/Bonn and Munich. An opening is also planned at Nuremberg airport for 2014.